Hi All! This is my first post, I have reviewed similar threads but no one seems to have the exact same issue as me, nor have I found anyone to have a finite resolution to this issue. In November I purchased an 06 Reg Chrysler Grand Voyager & a friend of mine did some work on it, requiring the battery to be disconnected. We have now re-connected the battery however, it appears that in so doing he has invoked the immobiliser. I have read many forum threads, watched YouTube videos but all I have managed to do now is make the alarm go off with the inability to stop it and the engine still won't start (dials do their initial "pre-flight" jiggle and settle, the engine just tat-tat-tat-tat-tat-tats as you turn the ignition key to start it & the immobiliser dash light blinks then stays on). To stop the loud decibel sound when the alarm goes off, we have disconnected the battery again but it is still sounding (but more quietly) so it must have a secondary power supply; we are hoping that with the battery disconnected this secondary power source will die and the alarm will stop! We had worked for several weeks on the car, disconnecting & then reconnecting the battery previously (we were replacing glow plugs) and we were previously able to succesfully start the car, then all of a sudden we couldnt, must have done something different this time or reached the maximum amount of times it could be removed before the immobiliser set in. The battery is virtually brand new and fully charged, btw, & the disconnection of the negative was to prevent possible shorts or surges to the electronics system. Any ideas whatsoever, I would be really grateful, I am located in PO8 Horndean Hampshire UK area (Near Portsmouth) and there are now no longer Chrysler centres in the UK for me to contact regarding this. Whilst my particular circumstance does seem a little different from some ot the other experiences described in threads, there does seem to be a complexity to these Thatcham immobilisers which frequently prevents even the owner from starting the car....but no doubt easily bypassed by a professional thief! I would even consider advice as to how or where i could get this removed, if it is going to be an ongoing issue with the vehicle, although this initial work being done on the vehicle will be coming to an end shortly, with the hope that nothing will be needed in the near future! The pre flight jiggle means the battery is low. """requiring the battery to be disconnected. We have now re-connected the battery however, it appears that in so doing he has invoked the immobiliser for several weeks on the car, disconnecting & then reconnecting the battery previously"""
- a battery for a 2.8 should be in the region of 80/800 and under 3 years old - what's yours ? - (2) car thinks its being stolen (a) test trigger [spade] wire / both ends of earth points on starter motor/battery ! Fab, thanks....its on charge as of now! 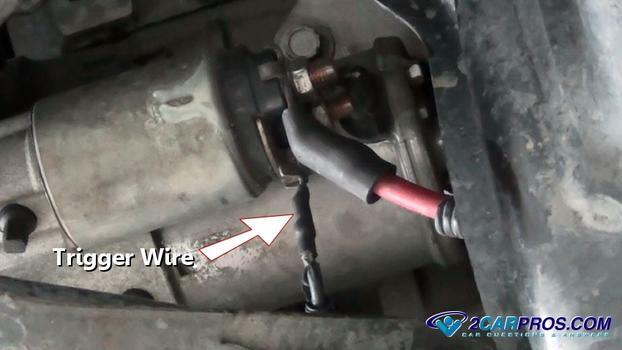 The starter motor on your car has 3 cables. 2 big thick heavy duty wires fixed by nut + bolt and 1 very thin light duty wire fixed by a spade. That thin '''trigger' wire vibrates and comes loose / gets dirty / gets knocked off its spade. When you sit behind the wheel in PARK with your foot on the foot BRAKE and turn you IGN on to START the GV it 1st sends a signal down that 'trigger' wire if the BCM does not get the reponse it expects it will not allow ANY voltage to the starter motor. Hope this helps. Problems after disconnecting the battery. Please help.